Where does mold grow in homes? What kind of mold grows on food? What are the health risks of mold exposure? What are symptoms and signs of mold allergy? What is the treatment for mold exposure? Is it possible to prevent mold in the household? Is it necessary to test for mold? How should people clean up and eliminate mold? Mold is a type of fungus. Some types of mold are commonly known as mildew. Mold may live indoors or outdoors and thrives in damp, warm, and humid environments. Although shower stalls and basements are typical moist areas prone to the growth of molds, any moist area in the household may harbor mold. The best way to prevent mold in residential areas is the control of moisture. There are no EPA or government standards that have been established for mold or mold spore levels in residential or commercial areas, so it is impossible to prove that a building or room complies with any health regulations concerning mold exposure. What is the treatment for allergic reactions to indoor allergens? Avoidance of identified indoor allergens can be very effective in controlling allergy symptoms. If such avoidance is not possible or incomplete, antihistamines are a common treatment for reactions to indoor allergens. These are medications that fight the effects of the histamine released during an allergic reaction by blocking the action of the histamine on the tissue. The so-called first-generation antihistamines include diphenhydramine (Benadryl), chlorpheniramine (Chlortrimaton), dimenhydrinate (Dramamine), brompheniramine (Dimetapp and others), clemastine fumarate (Tavist, Allerhist), and dexbrompheniramine (Drixoral). Molds are various types of fungi (singular = fungus) that grow in filaments and reproduce by forming spores that can travel through the air. The term mildew refers to some kinds of mold, particularly mold in the home with a white or grayish color or mold growing in shower stalls and bathrooms. Mold may grow indoors or outdoors and thrives in damp, warm, and humid environments. Mold exists in essentially any environment or season. The most common types of household mold found indoors include Cladosporium, Penicillium, Alternaria, and Aspergillus. Stachybotrys chartarum (also known as Stachybotrys atra and sometimes referred to as "black mold") is a greenish-black mold found indoors, although it is less common than the other types of mold found in homes. Stachybotrys grows on household surfaces that have high cellulose content, such as wood, fiberboard, gypsum board, paper, dust, and lint. There are types of mold that can grow on substances as different as foods and carpet. Molds reproduce by forming tiny spores that are not visible to the naked eye. Mold spores are very hardy and can survive under conditions in which mold cannot grow, such as in dry and harsh environments. These spores travel through outdoor and indoor air. When the mold spores in the air land on a surface where moisture is present, mold can then start to grow. Outdoors, molds play a role in the decomposition of organic material such as dead trees, compost, and leaves. They are most common in damp, dark areas or areas of decomposing plant life. People often find mold indoors in basements or shower stalls. Indoor mold in residential areas has the potential to cause health problems and can destroy surfaces and objects where it grows. Although bathrooms (particularly shower stalls) and basements are typical moist areas prone to mold growth, any moist area in the home can be moldy. 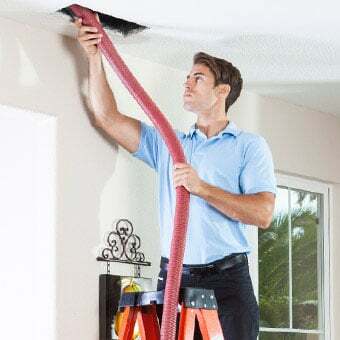 Drywall, ceiling tiles, carpets, furniture, ductwork, roofing, paneling, wallpaper, under sinks, and the areas around plumbing pipes are examples of areas in the home that can harbor mold if the ideal growing conditions are present. Mold spores from the outdoor air can enter the home through open doors, windows, and vents. It may also become attached to clothing, shoes, and pets and therefore be carried indoors. Mold can have many different colors (including brown, green, and black) and sometimes appears as spots. Additionally, a musty odor may be present. Mold growth may hide underneath carpeting, on the backside of wallpaper, and behind drywall or wall paneling. Mold thrives in saunas, greenhouses, and construction areas. Many different types of molds can grow on food. 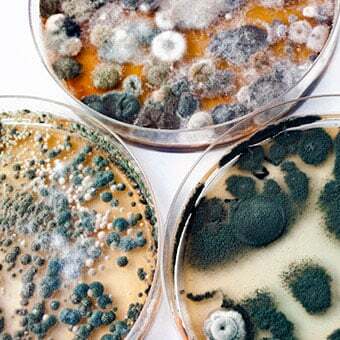 According to the U.S. Department of Agriculture (USDA), the types of mold that can be found in foods include Alternaria, Aspergillus, Botrytis, Cladosporium, Fusarium, Geotrichum, Monilia, Manoscus, Mortierella, Mucor, Neurospora, Oidium, Oosproa, Penicillium, Rhizopus, and Thamnidium. 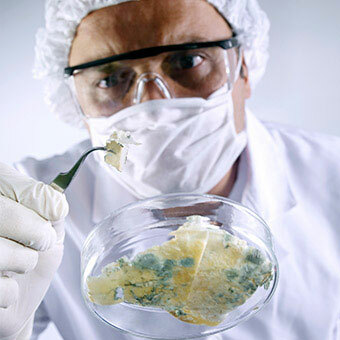 Certain kinds of cheeses are made with mold, like brie, gorgonzola, stilton, roquefort, and camembert. The mold that is part of the food manufacturing process is safe and does not pose health risks. It is also normal for dry-cured country ham and hard salami to have surface mold. The USDA has a helpful online resource that can show you what molds in food are safe and how to handle moldy foods. Molds produce irritating substances that may act as allergy causing substances (allergens) in sensitive individuals. Furthermore, some molds produce toxic substances known as mycotoxins, but mold itself is not poisonous or toxic. The term "toxic mold," therefore, refers to the fact that certain kinds of mold can produce mycotoxins. The conditions under which some molds produce toxins is not understood, and the presence of mold, even a mold that is capable of producing toxins, does not always imply that toxins are being produced or that a health risk or problem is present. Mold may not cause any health problems, or it may lead to allergy or other symptoms in people, including adults and children, who are sensitive to molds. Mold or mold spores may cause asthma attacks in people who have asthma and are allergic to mold. Even in some nonallergic individuals, mold can cause symptoms of irritation in the eyes, skin, and airways. For example, the "black mold" Stachybotrys, along with some other types of mold, produces toxins known as mycotoxins that can cause irritation of the skin and airways in susceptible individuals. Sometimes, people may develop severe reactions to mold exposure. Symptoms of severe reactions, which are uncommon, include fever and difficulty breathing. 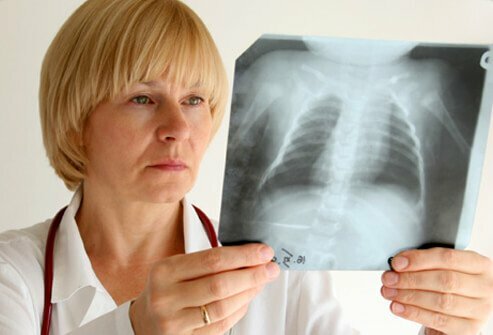 People with compromised immune systems or patients with chronic lung disease can develop serious infections of the lungs due to molds. It is not possible to predict the degree of severity of the health risks associated with mold in the home. 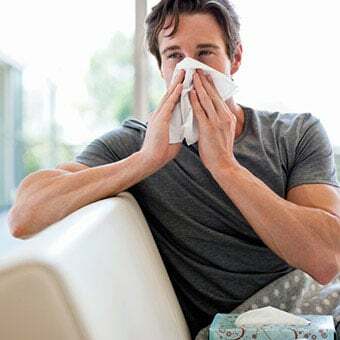 Allergic individuals vary in their degree of susceptibility to mold, and any symptoms and health risks also depend upon the extent and exact type of mold that is present. In 2004 guidelines update in 2009, the Institute of Medicine (IOM) reported there was sufficient evidence to link indoor exposure to mold with upper respiratory tract symptoms, cough, and wheezing in otherwise healthy people, although the report stated that was no evidence that mold causes medical conditions like asthma, bronchitis, or other respiratory conditions. Mold also worsens asthma symptoms in people who have asthma. Mold was also reported to be linked to hypersensitivity pneumonitis in individuals susceptible to this immunologic condition. This uncommon disease is similar to pneumonia and can develop in susceptible individuals after brief or prolonged exposure to mold, but there has been no conclusive evidence to prove this relationship. The treatment for allergic reactions to mold is the same as the treatment for allergic reactions in general. Fungal infections that spread throughout the body that occur in people with weakened immune systems are typically treated in the hospital with special antifungal drugs and other measures to support breathing and circulation. Treatment of underlying conditions such as asthma is described in the article on asthma and depends on the severity type of symptoms the patient experiences. The best way to prevent mold in the home is the control of moisture. Although it is impossible to eliminate all mold spores in an indoor environment, the mold spores will not grow in the absence of moisture, so controlling moisture is the key to preventing mold growth. 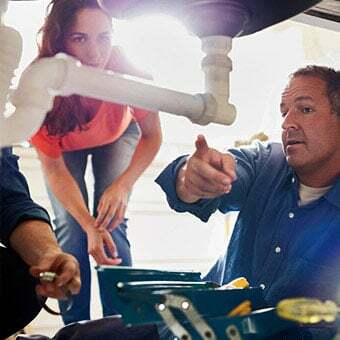 It's important to identify and repair water problems, such as leaks in plumbing or other structures that lead to moisture buildup. Clean and dry areas of leakage and water damage in the home within 24-48 hours to prevent mold problems. Use of an air conditioner or air dehumidifier during humid seasons can help reduce the potential for moisture buildup. Avoid the use of carpets in humid basements and bathrooms. Using fans and maintaining good ventilation in the home can also improve indoor air quality and help prevent or control dampness. Add mold inhibitor products to household paints. Keep indoor humidity levels low (ideally between 30%-50%). Use bathroom fans or open bathroom windows when showering for air circulation. Vent appliances that produce moisture, such as clothes dryers and stoves, to the outdoors when possible. Adding insulation can reduce the potential for condensation on cold surfaces (such as windows, piping, roof, or floors). According to the U.S. Environmental Protection Agency (EPA), if visible mold is present on inspection, testing is usually unnecessary. There are no Environmental Protection Agency or government standards that have been established for mold or mold spore levels, so it is impossible to prove that a building or room complies with any health regulations concerning mold exposure. Likewise, the CDC does not recommend routine sampling and testing of mold in the home. Health officials haven't defined tolerable or acceptable limits of mold exposure for humans, and since individuals vary in their susceptibility to mold, testing cannot reliably predict the degree of health risks from any occurrence of mold. When mold has previously been identified and cleanup procedures have been undertaken, sampling and testing may be carried out if necessary by qualified professionals to determine that adequate cleaning of a building has occurred. Mold clean up procedures are somewhat dependent upon the extent of the problem and the type of surface contamination. Large areas of mold in a building may require the services of a professional contractor skilled in mold removal and remediation. Scrub hard surfaces, such as walls, that harbor mold with detergent and water, and these should be dried completely. Discard porous or absorbent materials (such as cloth, ceiling tiles, carpets, etc.) if they become moldy. In some cases, it may be necessary to use a dilute solution of chlorine bleach (no stronger than 1 cup of bleach in 1 gallon of water) or stronger commercial cleaners to kill and remove the mold. Be sure to discuss any health problem with a health care professional prior to attempting to remove and clean mold if you have an allergy or are sensitive to molds. Use rubber gloves when washing with soap and water, but for bleach and harsher cleaning agents, nonporous gloves (for example, natural rubber, neoprene, nitrile, polyurethane, or PVC) should be worn along with protective eyewear. Wearing an N-95 respirator (available at many hardware stores) can further limit exposure to airborne mold or spores when cleaning. Avoid touching moldy surfaces with bare hands. After mold removal, it is important to prevent further regrowth of mold by keeping affected areas as dry as possible. "Adverse Human Health Effects Associated With Molds in the Indoor Environment." American College of Occupational and Environmental Medicine. Feb. 24, 2011. <http://www.acoem.org/AdverseHumanHealthEffects_Molds.aspx#sthash.h7g5iNu7.dpuf>. Switzerland. World Health Organization. 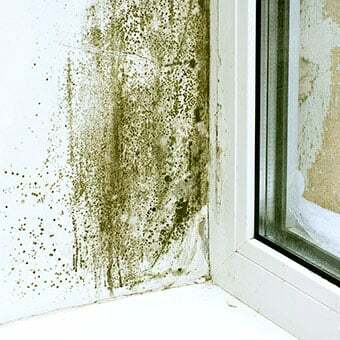 "WHO Guidelines for Indoor Air Quality: Dampness and Mould." 2009. <http://www.euro.who.int/__data/assets/pdf_file/0017/43325/E92645.pdf>. United States. Centers for Disease Control and Prevention. "Mold: Basic Facts." Dec. 20, 2017. <http://www.cdc.gov/mold/faqs.htm>. United States. Environmental Protection Association (EPA). "Mold." <http://www.epa.gov/mold/>. United States. United States Department of Agriculture. "Molds On Food: Are They Dangerous?" Aug. 22, 2013. <https://www.fsis.usda.gov/wps/portal/fsis/topics/food-safety-education/get-answers/food-safety-fact-sheets/safe-food-handling/molds-on-food-are-they-dangerous_/>. There is currently no cure for asthma, and no specific, single cause for asthma has been identified. Take this quiz on asthma myths to test your asthma IQ. Describe where you found mold in your home. Allergy shots are given to increase your tolerance to allergens that cause allergy symptoms. At the beginning, allergy shots will be administered once or twice a week for several months. The dose is increased each time until a maintenance dose is reached. Side effects of allergy shots include itchy eyes, shortness of breath, runny nose, tight throat, redness, swelling, and irritation. Patients who have infrequent, mild bouts of asthma attacks may use over-the-counter (OTC) medications to treat their asthma symptoms. OTC asthma medicines are limited to epinephrine and ephedrine. These OTC drugs are best used with the guidance of a physician, as there may be side effects and the drugs may not be very effective. Hay fever (allergic rhinitis) is an irritation of the nose caused by pollen and is associated with the following allergic symptoms: nasal congestion, runny nose, sneezing, eye and nose itching, and tearing eyes. Avoidance of known allergens is the recommended treatment, but if this is not possible, antihistamines, decongestants, and nasal sprays may help alleviate symptoms. WebMD shows you 10 ways to fight the fungus and reduce mold allergy symptoms from dust masks to bottles of bleach.